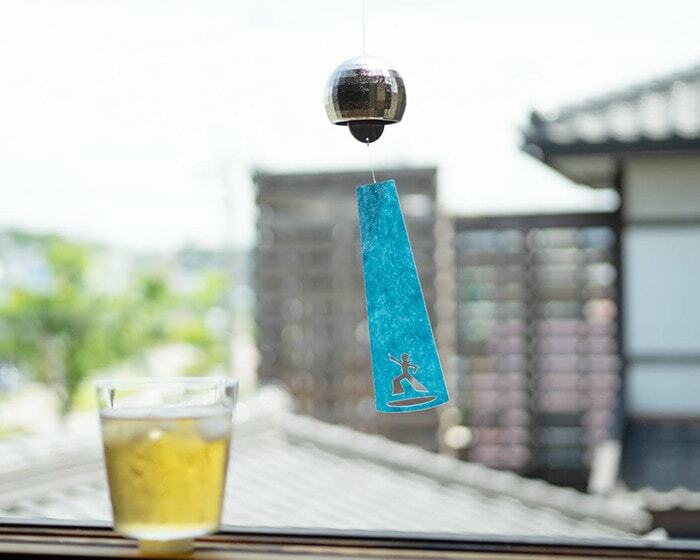 The sound of wind chime is a special feature of Japanese summer. 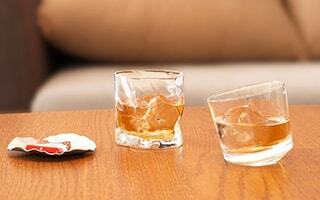 The clear sound brings us cool feeling. But these wind chimes are a little different. They bring us cool, and smile! It is very rare. 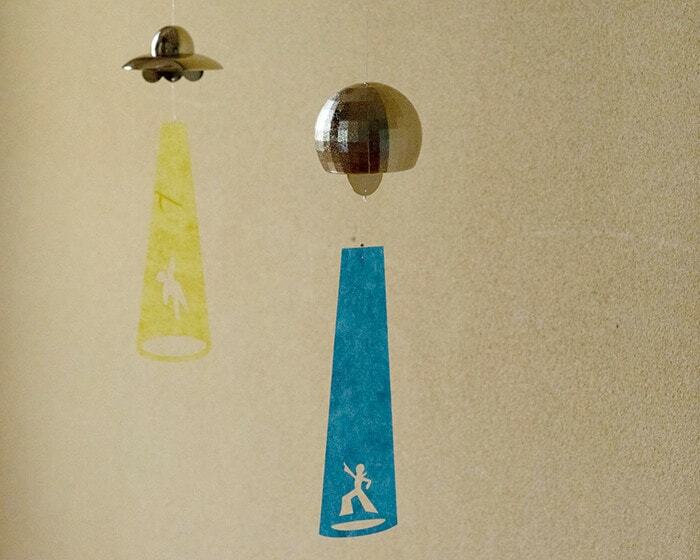 They are “UFO” and “Disco ball”. From children to adults, everyone cannot keep back an involuntary smile at these unique wind chimes. Unique and stylish wind chimes would be great items for wedding gifts or housewarming gifts. Also, wind chimes are suitable for summer gift. 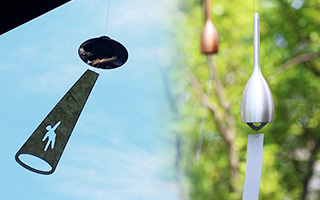 2 designers designed the unique wind chimes of Nousaku. 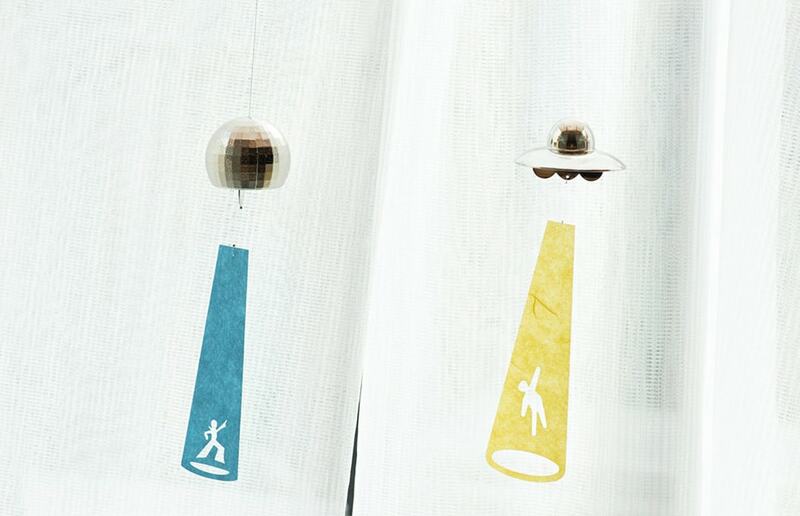 Let us introduce 2 wind chimes filled with playful mind. 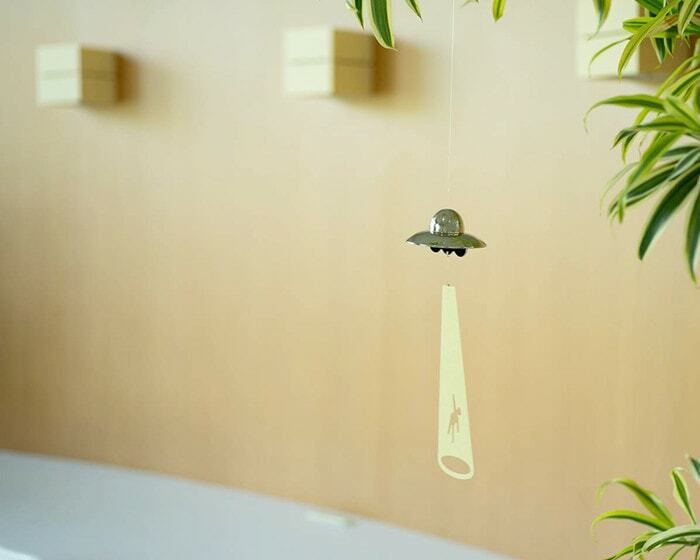 It is a wind chime designed with UFO motif. Just hang the unique wind chime by the window. 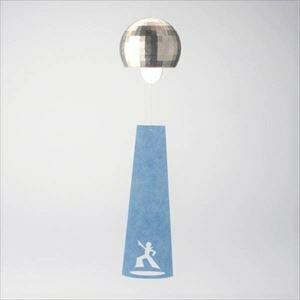 It looks like a UFO flies in the sky. Look at the slip! 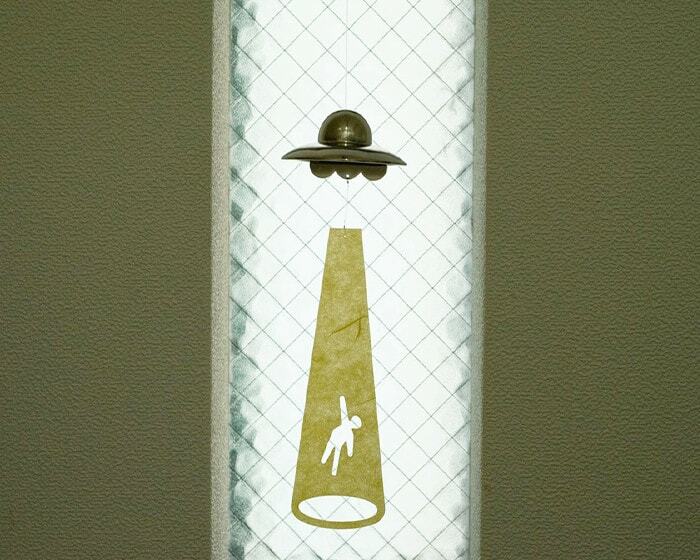 A person is about to be abducted by UFO. 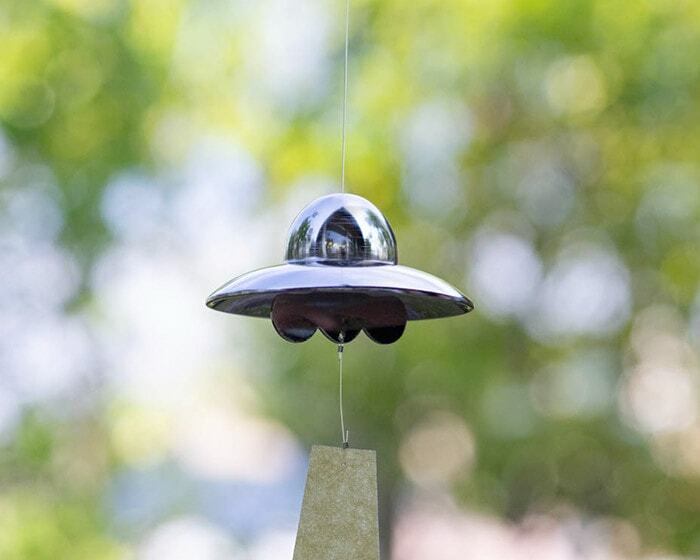 Every time we see the wind chime, the UFO makes us fun. 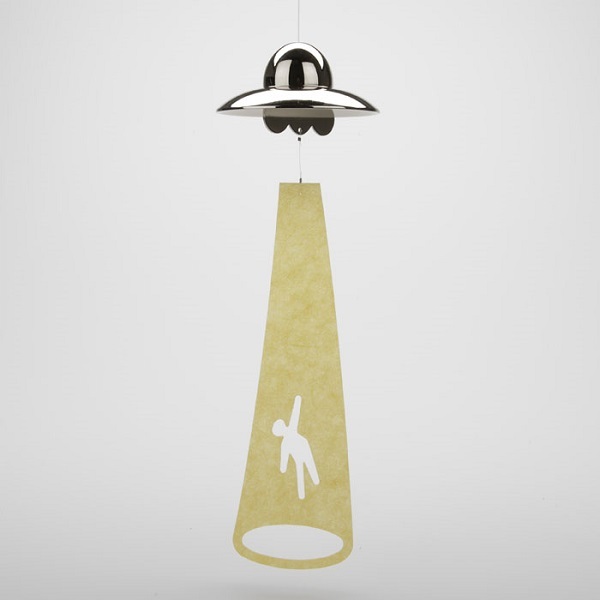 Craftsmen polish UFO one by one. The wind chime has applied mirror finish. 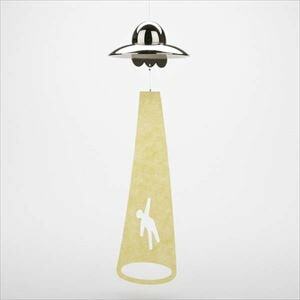 In addition, the UFO is plated nickel, and clear coated with urethane. When wind blows, the unique wind chime makes sound in a low key. 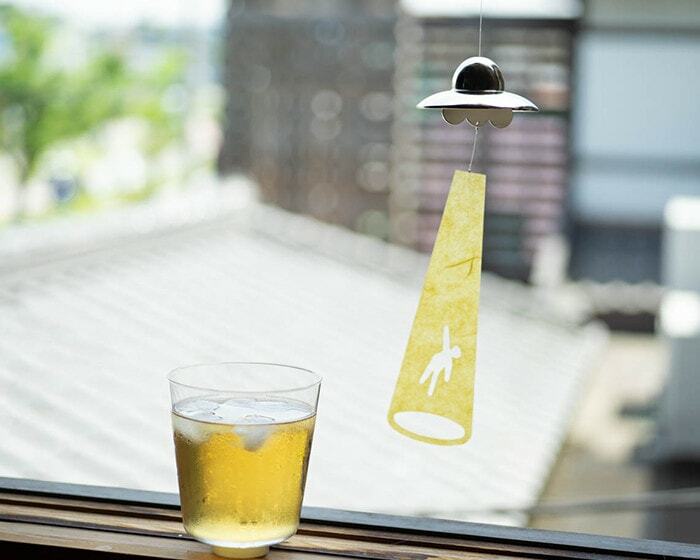 Satoshi Umeno designed this unique wind chime. 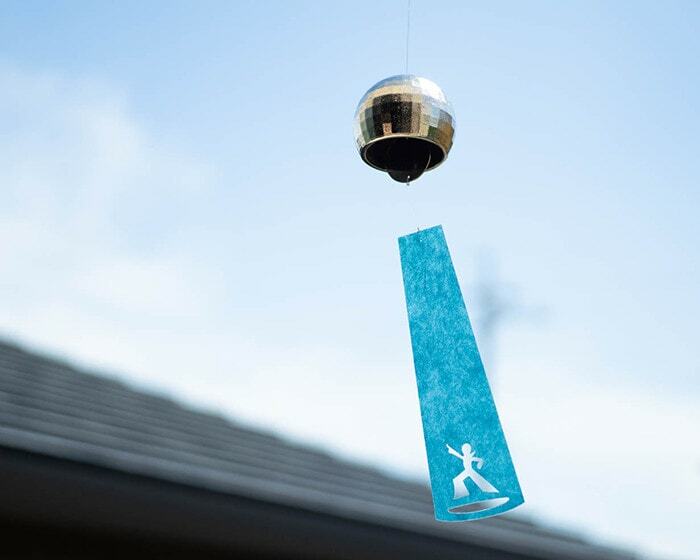 It is a wind chime designed with disco ball motif. Just hang the unique wind chime by the window. The disco ball turns round and round, and reflects light like a mirror ball. Look at the slip! A dancer strikes a trademark pose under the spotlight. 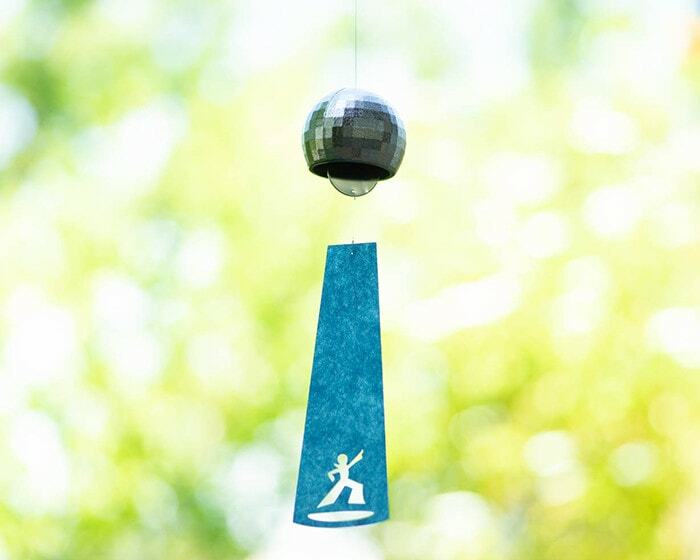 The unique wind chime looks like that it invites us to dance together. 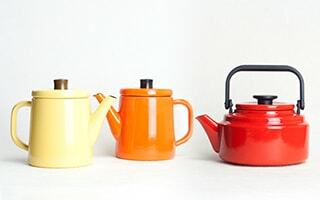 It is so funny design. 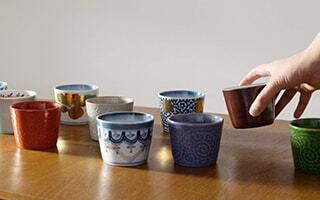 Craftsmen finish with their hands one by one to express the beauty of casting. 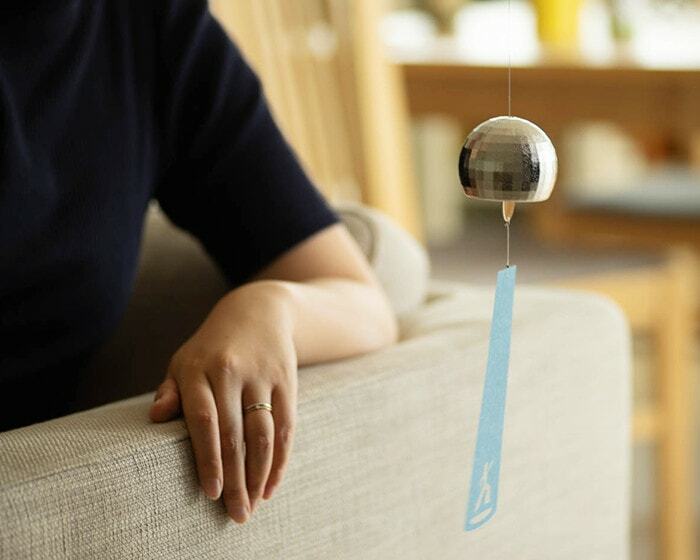 When wind blows, the unique wind chime makes clear high sound. Harumi Kubo designed this unique wind chime. It is true that the unique wind chimes have funny design, however, please do not forget about the sound. 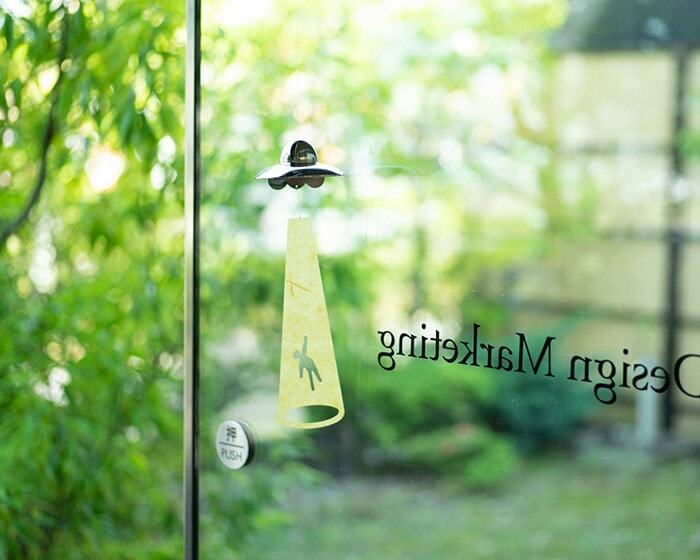 The beautiful sound of the wind bells attracts us. 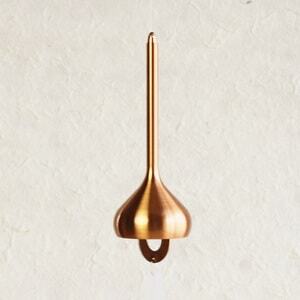 The unique wind chimes “UFO” and “Disco ball” from Nousaku are made of brass (60% copper & 40% zinc). 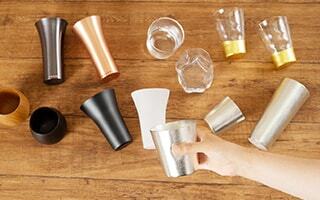 In fact, brass wind chimes make Nousaku famous as a top brand of Takaoka copperware. 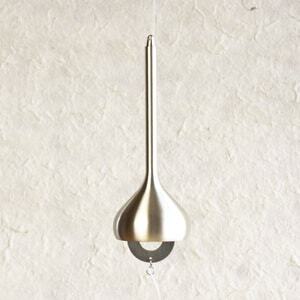 Wind bells of Nousaku are characterized by their clear sound and modern design. 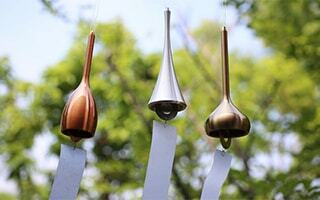 They are called “Takaoka brass wind chimes”. 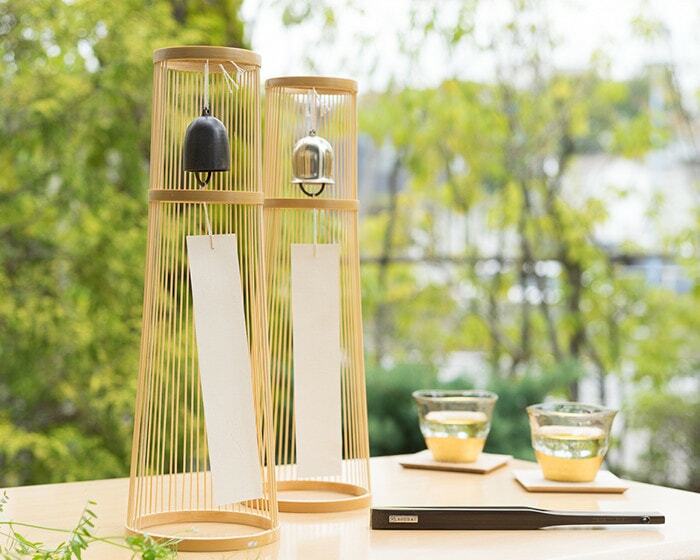 Now, the worldwide buyers in Italy, Paris, or Shanghai pay attention to the wind chimes of Nousaku. 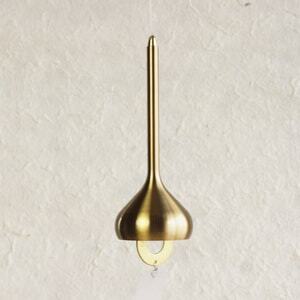 Brass wind bells have clear sound that can be only created by casting metal. 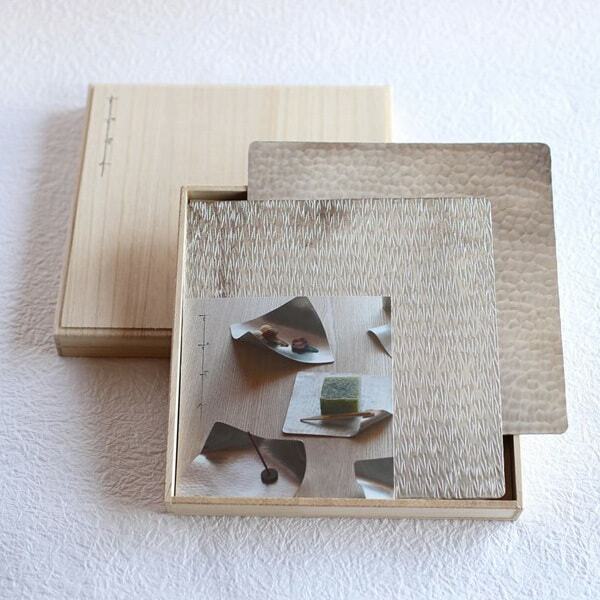 The collaboration of unique material and skill of Nousaku craftsmen create clear sound and gentle lingering tone. Please enjoy every bit of the beautiful sound of unique wind chimes in your favorite place, and survive hot summer. 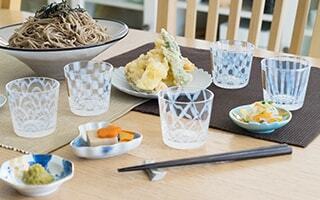 Since wind chimes of Nousaku have stylish design, you can enjoy them as interior goods. For example, hang the wind chime on the door. The unique wind chimes become doorbell. 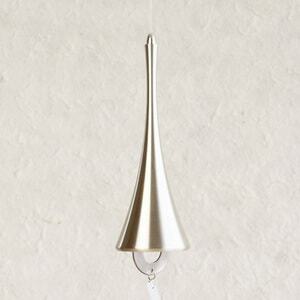 Hang the wind chime under the eaves in summer, and hang it in living room as an art object. The wind chimes are not only for summer. Since a metal ring is applied in the end of string, you can hang the unique wind chimes in your favorite places. 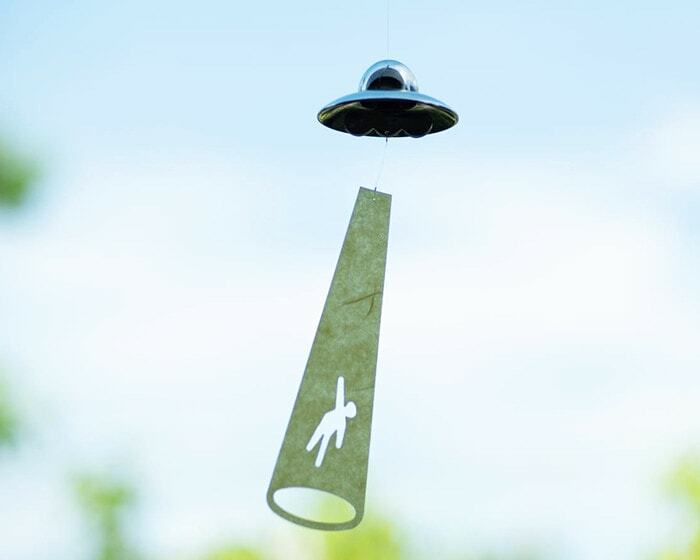 Stylish, funny, and unique wind chimes would be great gifts. “Nousaku” produced the unique wind chimes “UFO” and “Disco ball”. 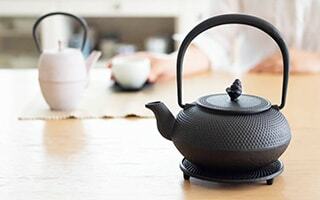 Nousaku is in Takaoka city of Toyama prefecture, and a casting studio that inherits skills of traditional Takaoka copperware. 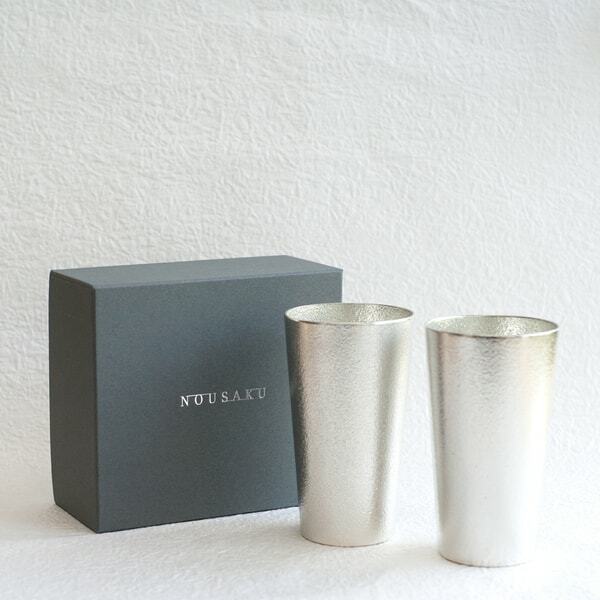 Their concept is “Make better casting in better way.” Nousaku has pursued the beauty with using the maximum use of texture of material such as brass or tin. Only great skills of Nousaku’s craftsmen make it possible to produce the beautiful sound and original form of the unique wind chimes. 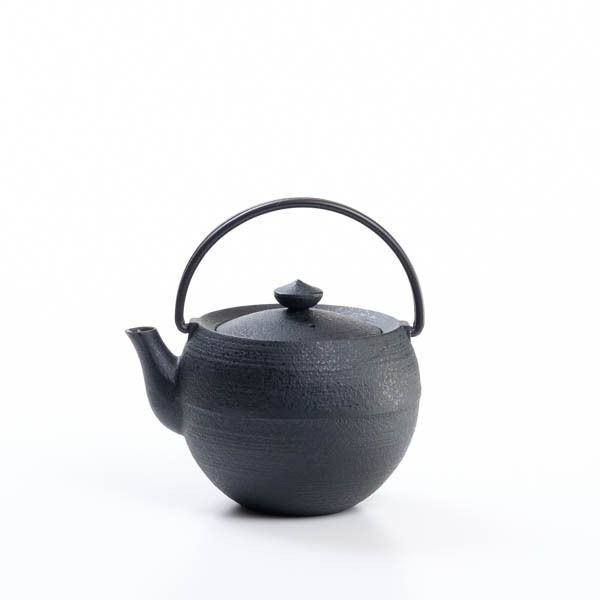 Nousaku continues to try new possibilities of casting with mixing 3 components “Tradition / Skill / Beauty”. 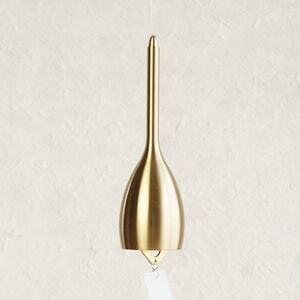 If you like stylish brass wind chimes of Nousaku, we also recommend these simple and modern wind chimes. 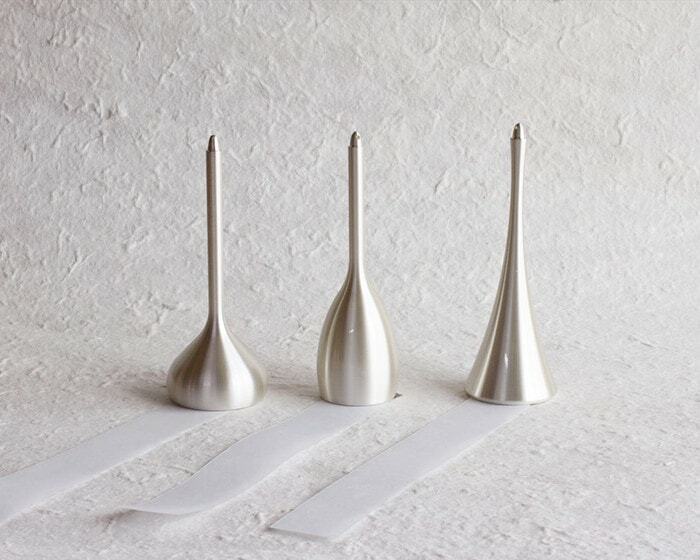 “Horn” has smart design, “Onion” has cute atmosphere, and “Slim” is a stylish wind bell. The elegant gloss of hair-line finishing and artistic form have got great popularity. However, the greatest feature of the wind chime is its sound. High-class wind chimes of Nousaku have been popular among men, too. 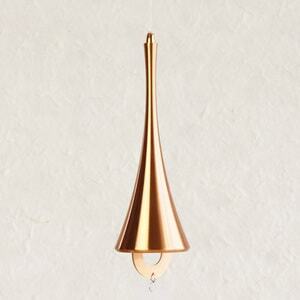 [Nousaku] This brass wind chime is different from usual wind chime in the sense of material and its sound. Brass makes a high and transparent sound like “jingle.” Three colors, three types. 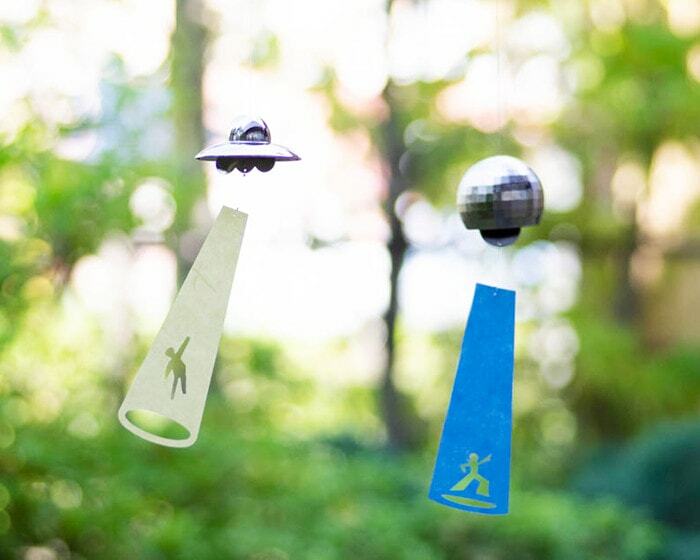 Enjoy finding your favorite wind chime! We have more stylish wind chimes! 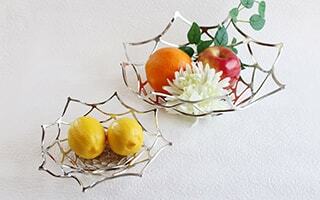 If you look for wind chimes of traditional crafts, please check this page. 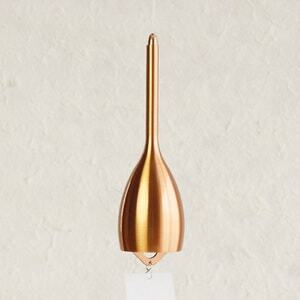 Japan Design Store selects wind chimes which have elegant sound by traditional skill and modern design. We have simple wind chimes, unique wind chimes, and tabletop windchimes. 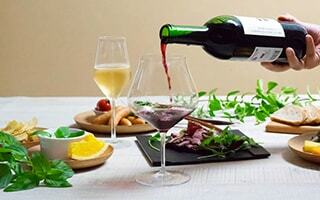 Stylish wind chimes make your summer life richer and happier. 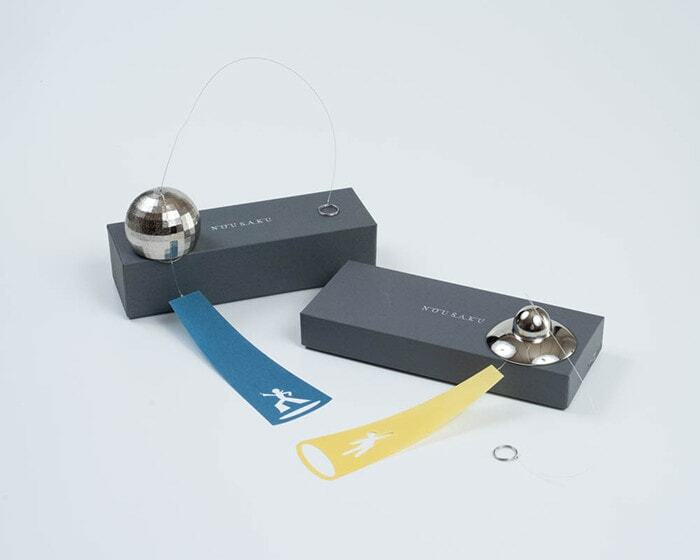 How about sending unique wind chimes as gifts for dearest person? 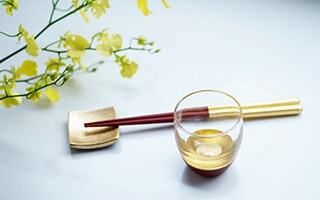 In Japan, wind bell has been called “Narimono (鳴り物)”, or musical instrument. 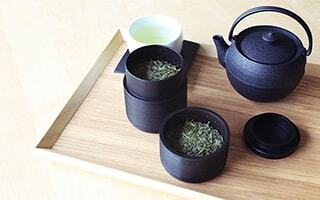 “Narimono (鳴り物)” reminds us “Narimono (成りもの).” The latter word means to succeed or get promoted. So, wind chime is an auspicious item. Unique wind chimes of Nousaku would be great wedding gifts or housewarming gifts as auspicious items. 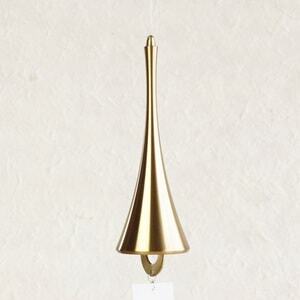 Funny design wind bells are also good for celebration gifts to those who open new business. 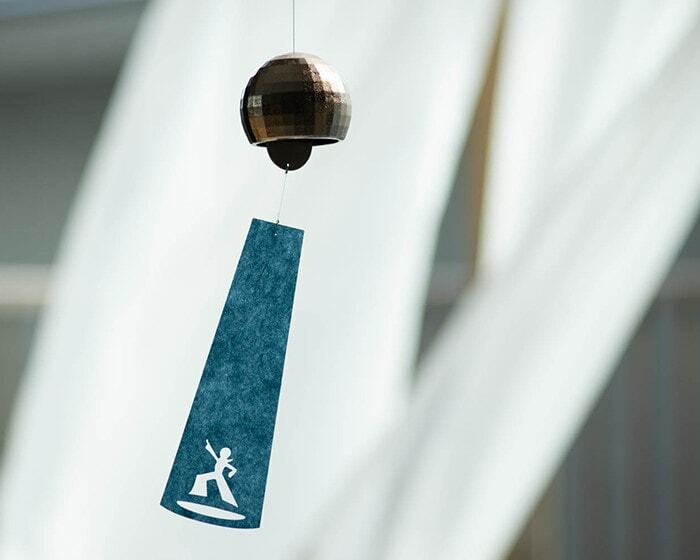 Unique wind chimes become stylish interior goods, and make people smile. 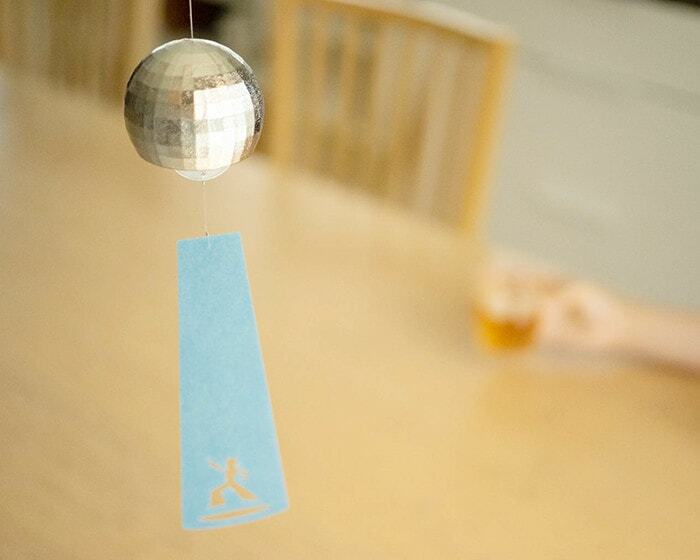 In addition, Japanese wind chimes are suitable for birthday gifts or seasonal gifts in summer. If you send gifts, please pursue gift wrapping as well. 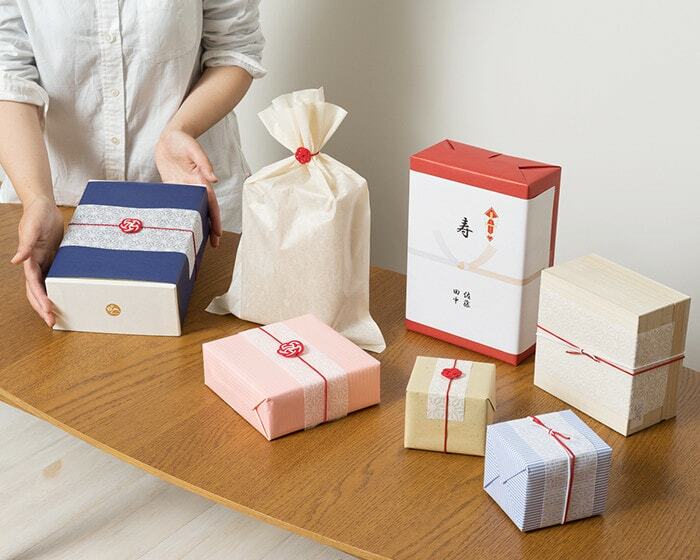 Japan Design Store offers various gift wrappings for unique wind chimes of Nousaku. 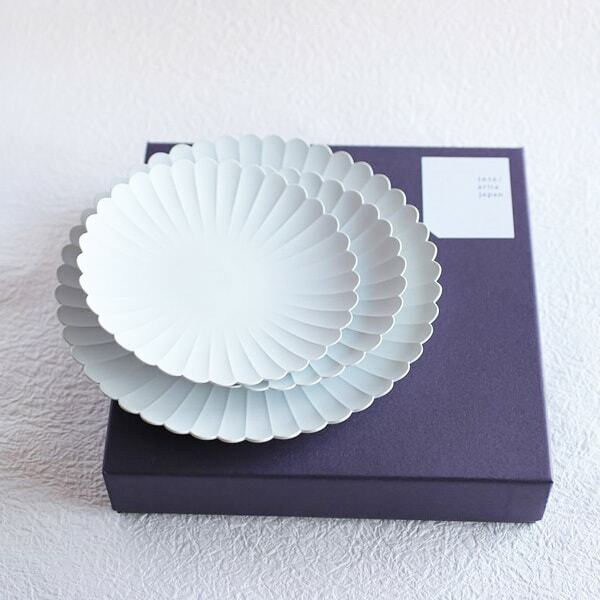 You can choose elegant Noshi wrapping or chic Wrapping paper. 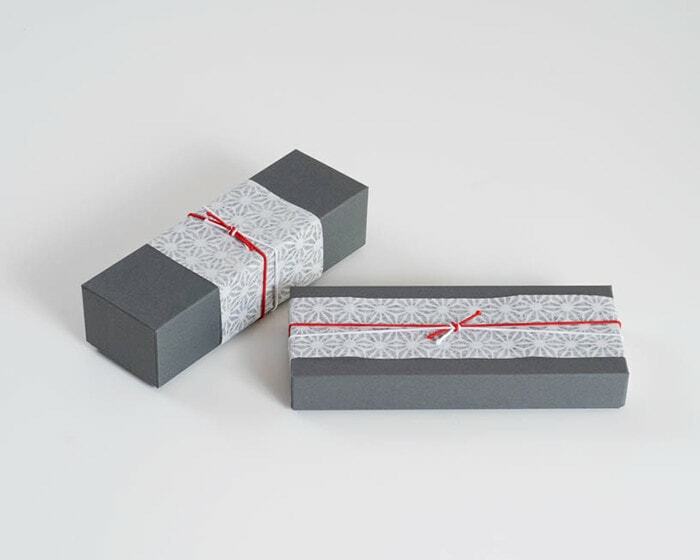 Our gift staff carefully wrap your important presents. 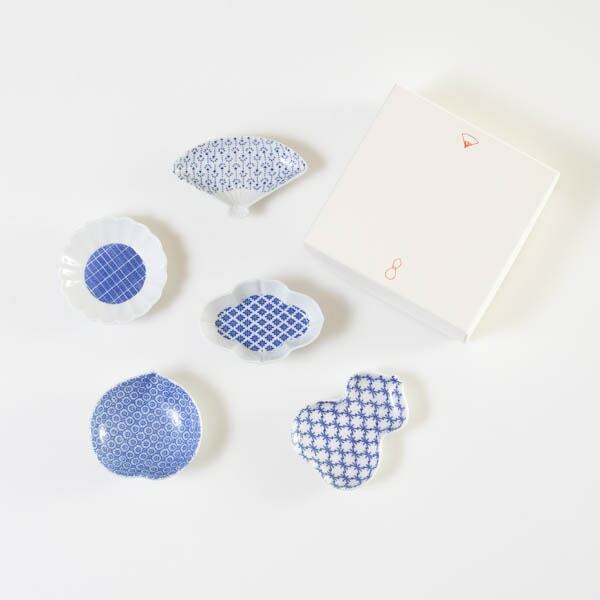 If you plan to send special gifts, please leave it to Japan Design Store. * Do not rub with metal polisher. * Although the wind chimes are finished with color fixing, the chimes change their colors over the years slightly. Please enjoy the unique texture of casting. 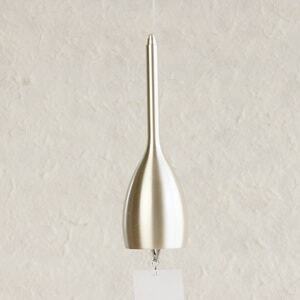 * The slip of wind chime is made of water resistant Japanese paper. However, it is not a prefect waterproof. * We recommend using the wind chimes in your house while it is strong wind or bad weather. * After use, wipe water drops or dust with soft cloth. 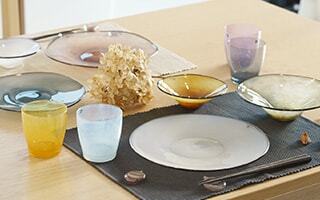 * If the dirt becomes remarkable, remove the dirt with wet cloth or sponge with neutral detergent. After that, wipe the place with dry cloth so that the detergent does not remain.